I am pleased to tell you that I have just completed an interesting interview with a uke player and builder who is becoming increasingly well known in the ukulele community. Say hello to Darryl Cursley of Cursley Ukuleles. Darryl and I hooked up as part of the UK uke community some time ago, and he is both a ukulele bass player in the Mother Ukers and a ukulele builder of rapidly increasing renown. In particular he enjoys sharing the development of his ukulele projects with the wider world and is and extremely popular “follow” on Twitter (@cursleyukuleles) and Facebook, on which you can see excellent photographs of his ukes as they develop from raw wood to finished instruments. He is a beginner builder, but does have a fair few under his belt now and the quality is just astounding. So, how did you start out with the ukulele? I got bought a £20 uke for my birthday by our good friends Sandie (@funkychoir) and Phil (@fingersphil) for my 37th birthday, (I'm 38 and a half now) I was chuffed to bits, hardly put it down, traded it in for a better uke and that was it really.. I'm a bit of a sucker for knowing what ukes people have owned Darryl – can you tell us what ukes you've bought over the years? Ukes I've bought? Well, that's a simple answer.. Surprisingly, its just one.. A Kala acacia tenor, that's it. I bought it to take some measurements for the first build and generally to get the feel of a uke, how it played etc. 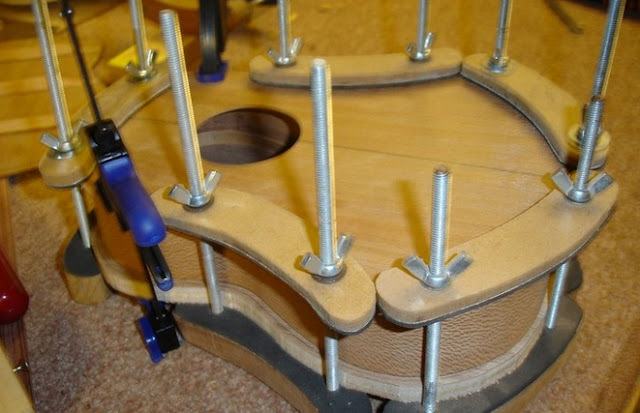 What was your background that gave you the skills to start making ukes? Although I've always been a carpenter, I'm a roofing carpenter by trade, so have only ever used huge timbers and a circular saw... I'd never attempted any fine carpentry before building the first ukulele.. That being said I've been working with my hands for 20 years so I have an excellent grasp of hand tools.. It must have been daunting starting your first – how did that go? The first build went great! It came around in a weird way, I was in the Southern Ukulele Store (in Bournemouth UK) talking to the manager and my buddy Paul Tucker (@LuapRekcut) about ukes and he was showing me a uke a guy had built on the Pete Howlett weekend luthier course. The first thing that struck me was how simple it was, and secondly how much Paul loved it. He then told me how much he'd love a handmade uke of his own... Also at this point I'd had an offer from an excellent local luthier by the name of Lee Norris to give me lessons in instrument making (Link to Lees site here )I took him up on his offer and told Paul to watch this space. From the word go I paid every week to go build the first ukulele with Lee, so once or twice a week I'd go and listen, do what he told me and he'd also set me homework to complete for the next lesson. I still have lessons with Lee, I can build a lovely uke now but the depth of knowledge that man possesses is unbelievable. He could lecture on any instrument built in the last 1000 years, then build it, and then play it perfectly... I'll probably always have lessons with Lee. I know it must depend on the amount of 'bling', but roughly how many hours go in to making your instruments? That's a toughie. As I build around my day job and life, I don't have a huge amount if momentum to my builds, I tend to spend more time thinking about what to do than doing it, if you see what I mean. I know at the moment I spend maybe up to 80 hours on each uke, maybe more. I like things that are perfect, and therefore assume everybody else does, and if anything in the entire world should be perfect, it should be a handmade ukulele. The amount of hours I spend on a single uke will drop as I gain more experience, but I'm not prepared to sacrifice even 1% of quality for that. They will take as long as it takes to get them perfect. Probably a difficult one, but what was your most satisfying build? I can't say. You don't point out your favourite kid do you? 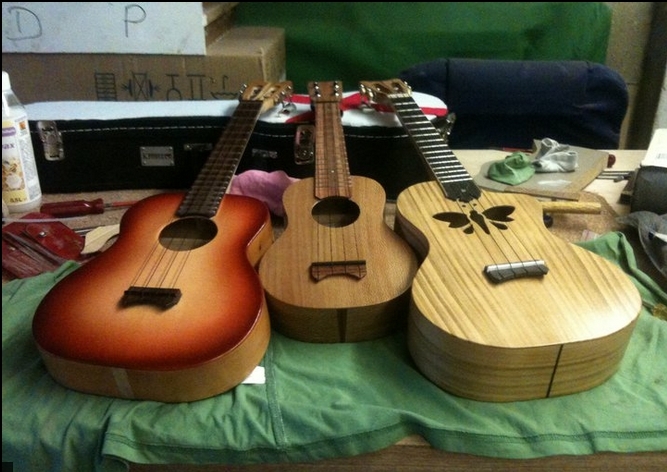 This is a little like that to me, I adore elements of each of the ukes I've built, the back of the cherry butterfly tenor, (the bookmatch and finish on that is something else) the headstock on Pauls yew tenor, I just can't choose. I am just starting a build that could be a candidate though, Tony Caseys soprano, now that, is going to be an awesome build! The level of forethought that's gone into the uke already is gonna make it a winner. You have told me that you like to experiment with unusual woods, and English woods – what are your favourite materials, and what do you think they bring to the finished instrument? I ask everyone this question, but what is your best tip for a new ukulele player? Best tip for a new uke player? Hmm.. GO BUY A *&%£ING TUNER.. or something like that.. Less sweary and shouty probably.. But I would look serious when I said it. So, where do you hope to see your business going in the future? Business wise, I guess we'll just have to see. I think I'm getting sort of 'heard of' a little now, but let's be honest, I'm still in the hobby builder class. I have maybe six or seven builds in front of me now, but none of the pressure of being full time, I'd need to develop a rhythm which I don't have right now, and don't have time to do, I own and work a fire door business and my wife (@DaisyUkulele) is in the family way so life's pretty busy. But like all businesses there's supply and demand, and if the demand for Cursley Ukuleles needs supplying, I won't hesitate to step up the operation. I LOVE building ukuleles... I LOVE spending hours in the workshop, I LOVE finishing an instrument and I love being twenty feet away when they pick one of my ukes up and I see their mouth make the 'wow' shape..
You certainly are now well known in the uke community – what are your thoughts as to what makes the uke community so helpful and friendly? "No.. Not at all, but, it's different isn't it? I play uke for fun and because it makes me happy, and I want to have something nice to share my fun times with"
If you see a bunch of folks all holding ukuleles, it sends out a message, and that message is that we're all just here to have fun and get along... Perfect. Darryl, what a brilliant way to end – cannot agree more! I would heartily recommend that my readers check out more of Darryls work which you can see on his Blog or his Facebook page. Oh, and Darryl, put me on the list for a Cursley! What a cool interview! I wonder if he'll make a toe pincher coffin model for Halloween...with a bat shaped soundhole. As spooky as this sounds, I do think there may be a spooky uke in the pipeline!